All Yamaha YFZ450 Dasa exhaust systems are handmade here in the USA and the quality really shows with perfect tig welds, trick billet end caps, a billet canister mount, thick head pipe flange and the end caps do unbolt for easy canister repacking. The Yamaha YFZ450 Dasa exhaust system has been proven on the dyno to make big HP throughout the entire power curve. 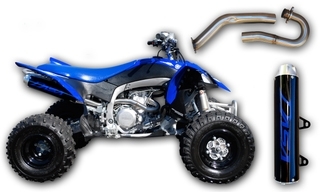 This is a multi-step, stainless steel exhaust system that includes a head pipe, mid pipe, and an exhaust canister. Optional Quiet Core is available for this model and is sold separately (Spark Arrestor Included with Classic models).